For The Price of a pint of beer per week! With rising fuel costs, grossly over-crowded roads, vandalism and theft, it is no wonder that caravan enthusiasts are seeking a simple solution to both caravan storage and transport problems. At Carastore (East), we have a very simple solution. Not only do we offer long term secure storage facilities, but also specialise in short term storage, that will enable you to return home, leaving your caravan secure, close to your favourite touring site, ready for your next return. We are located 10 minutes from Skegness, Lincolnshire, close to the quaint market town of Wainfleet. 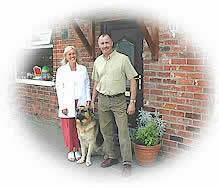 We offer secure, 24 hour, year round caravan storage, on hard standing ground in a locked, dog patrolled secure compound. Appreciating how your caravan investment can rapidly deteriorate if the seals allow rain to penetrate the caravan panels, we now offer under cover storage, fully protecting your caravan from damaging rainy weather. Even if panels are not correctly sealed, under cover storage will help prevent further damp penetration over winter months. The location is ideal for long term / winter out of use periods. If you visit the popular Lincolnshire coastal area often, wouldn't it make sense to leave you caravan at a secure local location. Just imagine the fuel saving, reduction of wear and tear of your vehicle, freedom from vandalism and added privacy when you are away from home. Plus, you will not have the worry of traveling miles towing your caravan - highly beneficial if you are an unsure driver, or perhaps getting on in years. To enhance your caravan break, on request, we will collect your caravan from your touring location and return it to you whenever you require - thus it may never be necessary for you to ever have cause to tow again. This could be an ideal solution for those who seek a static location - but without excessive recurring costs, and a need to stay at one location. And finally - before you collect (or we deliver) we offer to check your tyre pressures and grease the support legs & ball hitch. Other services available include valet service, and we will even arrange for a holiday food starter pack to be available with your caravan. While at this time we do not offer full caravan servicing, we can arrange this for you with a local supplier. Our prices start at as little as £5.00 per week for basic winter storage and £7.00 per week under cover - call us now for the latest prices to match your requirements and timing. Peace of mind is just a click away - contact us now and we will help you with the rest.